Home / Entertainment / Think. Create. 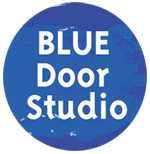 Explore and Collaborate with Blue Door Art Studio this Summer! Trust us. Summer IS coming. Soaking up the sun, riding the waves and summer fun will eventually be in full swing. With Blue Door Art Studio’s Summer Camps & Classes, your child can add painting, drawing, sculpting and even animation design to their summer checklist. 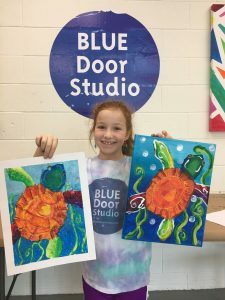 Blue Door Art Studio is accepting enrollment now for their Summer Art Camps & Classes and you’re not going to want to miss this! Perfect for kids aged preschool through high school, Blue Door Art Studio’s classes tout names like; Flower Power, Pop Art, Sweet Treats, Native American Art, Under the Sea, Art in Motion, Fashion Week, Travel the World and more. You can see the full list of classes that run from June through August at https://bit.ly/2uK12Jd. For children ages 3-6, Blue Door offers a thematic based art camp week that includes drawing, painting, plus a creative movement/music lesson and creative writing component to enhance the creativity of the whole child. Camps for the 7-12 age group even include an hour of yoga which speaks to the mindful approach so important to Blue Door Art Studio’s mission. Architecture, Mixed Media and Paper Mache building are just a few of the classes included in Blue Door’s offerings for kids up to highschool aged. For example, in the Art is a Dream camp, kids learn about Surrealism and create their own magical landscape collage and sculpture as they explore the idea of dreamscapes! There are half day and full day options along with snacks included in many of the classes and camps. 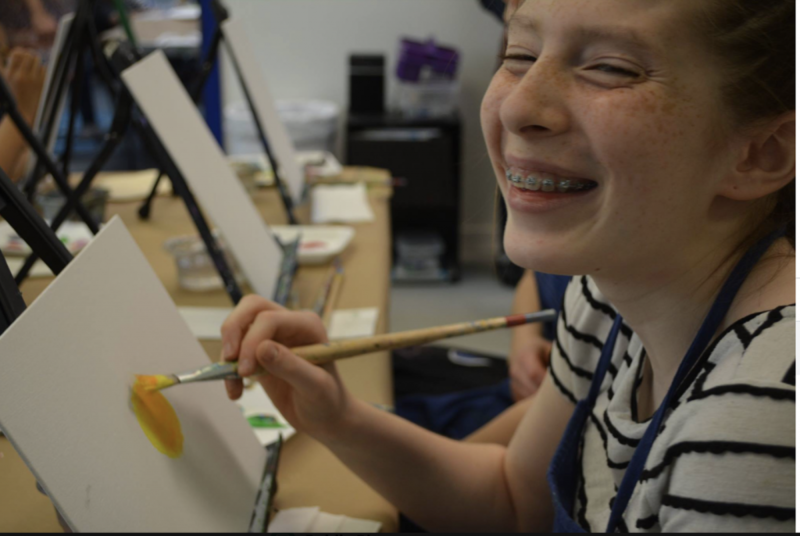 If you’re looking more for a class than a camp, Blue Door offers a Paint a Canvas class on Tuesdays, Thursdays and Saturdays where artists can choose an image and then learn how to paint it. Campers who enroll in more than one class receive a Blue Door Art Studio t-shirt! Grand finale art exhibits are held every Friday for camp goers and their families to enjoy. In operation for over ten years, Blue Door Art Studio is located at 115 Pleasant View Avenue in Smithfield, Rhode Island. The studio is owned and operated by Claudia Venditto(RISD MAT 1995.) With over 20 years teaching experience in the Cranston Public School System, Claudia and her staff create a positive and enjoyable educational atmosphere where students thrive. The Blue Door Art Studio excels at progressing students’ development as artists. Every summer tells a story. FIll your child’s summer chock full of creativity, exploration and collaboration with Blue Door Art Studio’s Summer Camps & Classes. Register today! *Blue Door Art Studio even offers classes for adults so if this blog post is reigniting or inspiring the artist in YOU, be sure to check out their classes for adults at https://bit.ly/2uK12Jd. Previous Featured Listing…67 Primrose Drive in Warwick! Next The 5 W’s of Journey Into the Soul Wellness Center!